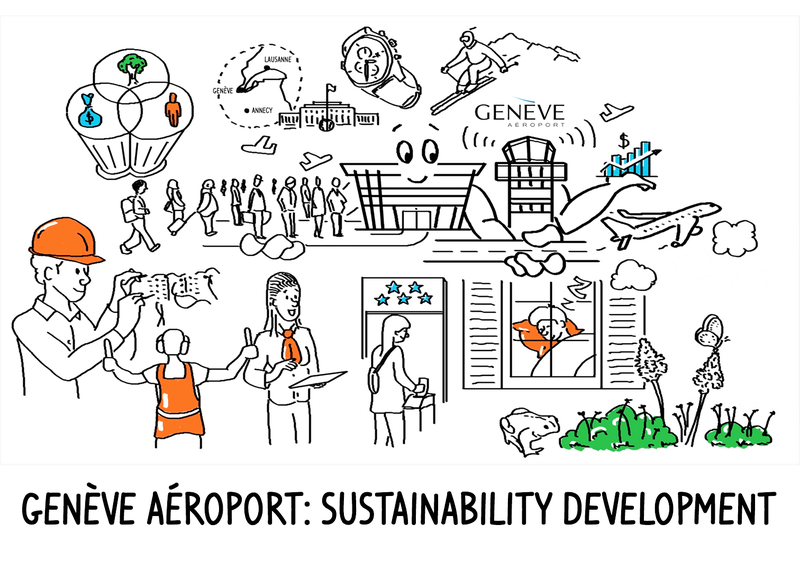 Project objective: To create for Genève Aéroport a 4-minute video in French for employees and partners explaining what sustainable development is about and what it means for Genève Aéroport. The video should introduce the Brundtland definition, the notion of triple bottom line as well as the ways Genève Aéroport makes decisions taking into account the economic, social and environmental components. Video making process: The original script was written by Denis Teuscher, sustainability project manager for the sustainability team. I provided some feedback in order to optimize the script for the purpose of an hand-drawn video. Once the script was finalized, I started sketching the drawings illustrating the video. I created an airport character with arms and hands to illustrate the mission of the airport to provide optimal conditions for air traffic in Geneva and to meet the demand in the region today and in the future. I also used three colours to help the viewer connect the various elements in the video to the three elements of the triple bottom line. I packaged all the drawings in a storyboard to help Genève Aéroport understand how the video would run once drawings are animated and synchronized with the voice-over. Thanks to valuable feedback from Genève Aéroport, I changed a few drawings to have the best possible illustrations given the objectives of the project. Once the storyboard approved, I drew all the illustrations from scratch again recording my screen as a video using a screen recording software (see inside the creation of my videos for more details) and edited the final video with Final Cut Pro X using the voice-over recorded by a Geneve Aeroport staff named Bertrand Staempfli. The final HD (2K) video was delivered in a .mov format optimized for online upload. More about the environment at Genève Aéroport: Genève Aéroport has for many years implemented a series of environmental measures as part of its quality, environmental and safety management system. Genève Aéroport aims to restrict disturbances caused by air traffic, airport activities and airport-related road traffic. Genève Aéroport fifth environmental report “Environment – results and objectives 2013” was published in June 2011. A sustainable development report is now published every two years since 2014. See all animation video projects here.